I’ve been reading some of Mari Sandoz‘s works: “Old Jules,” her biography of her father; “Crazy Horse, the Strange Man of the Oglalas”; and “Cheyenne Autumn,” the story of the tribe’s 1878-79 exodus from Oklahoma to Montana. All of the books were researched and/or written in the 1930s and ’40s, but they’ve aged well, maybe because they are unique in their perspective: a native daughter’s inquiry into her settler father’s brutal and brutalizing past; a white woman who spent so much time with both tribal people that she produced that somehow channel their experience (that’s not just me saying that; Vine Deloria Jr., who chronicled his Sioux people and was fiercely critical of white culture’s misunderstanding of Native Americans, wrote an introduction to “Crazy Horse” and called it “a work of real genius”). … had their “first real encounter with the United States Army in the Grattan fight of 1854. At that time the white men in the region were only a few little islands in a great sea of Indians and buffaloes. Twenty-three years later, in 1877, the buffaloes were about gone and the last of the Indians driven to the reservations—only a few little islands of Indians in a great sea of whites. This exploit of modern man is unrivaled in history: the destruction of a whole way of life and the expropriation of a race from a region of 350,000,000 acres in so short a time. It entailed first of all a tremendous job of public conditioning. In the 1830s and 1840s the buffalo Indians were considered the most romantic of peoples, drawing visitors from everywhere. Such men as Prince Paul of Würtemberg, Prince Maximilian, Sir William Drummond Stewart, Catlin, Parkman, and hundreds of others came to ride in the surrounds, to eat roast hump ribs, to study and become one with this great Red Hunter. By the way, this week is the 140th anniversary of the Cheyennes’ attempt to break out of Fort Robinson, the northwestern Nebraska outpost where part of the band that escaped from Oklahoma in September 1878 was being held. The breakout, in which more than 60 of the roughly 140 Cheyennes held inside an empty, unheated barracks died, followed the Army’s attempt to starve the imprisoned group into returning to Oklahoma. “On your left!” It’s something you call out when you’re overtaking another cyclist on the road. It’s a courtesy, a heads-up. It can be an abrupt or friendly moment. It offers an instant of connection to that other cyclist you’re passing or being passed by. On long, long rides, if you happen to be the cyclist on the right, the one overtaken, the words might stir you from a reverie or snap you out of your focus on the fog line on the road’s right edge. Or if you’re riding at night out in the country, that voice in the dark might remind you that there’s more in the world than oncoming cars or the little pool of light that your headlamp casts on the pavement ahead. Then the encounter ends. The passing cyclist moves ahead. They disappear around that next bend in the road; at night, their tail light grows dim and vanishes. Maybe you’ll see them at the next stop along the way, or as they stop to check a map at a crossroads. The ride goes on. Well, the night before last, a good friend and memorable cycling companion passed away. It was not a surprise. He had been fighting cancer — a particularly nasty, debilitating form of the disease for someone who was as strong on the bike as he had been. I’m not mentioning his name because I don’t think his family has made the news public yet. But I’m thinking about him, and them, on this rainy, gloomy Christmas Eve — which come to think of it is not too different from many of the days we spent riding together. Anyway. He’s overtaken me — on my left — and the rest of the pack, and has headed up the road beyond that next curve. Good riding, buddy, wherever the road takes you next. “In 1919, Brussells-Amiens was won by a rider who rode the last forty kilometers with a flat front tire. Talk about suffering! He arrived at 11.30 at night, with a ninety-minute leave on the only other two riders who finished the race. That day had been like night, trees whipped back and forth, farmers were blown back into their barns, there were hailstones, bomb craters from the war, crossroads where the gendarmes had run away and riders had to climb onto one another’s shoulders to wipe clean the muddied road signs. The other day, the California Department of Forestry and Fire Protection — Cal Fire, for short — caused a little bit of a ripple when it issued a report that likened the conflagration that recently consumed most of the town of Paradise with the World War II Allied bombing of the German city of Hamburg. The comparison was included in a Cal Fire green sheet — a preliminary report the agency does to review the circumstances surrounding firefighter deaths and injuries. I’ve become a regular reader of the reports mostly because I’ve been editing stories by a colleague in the KQED newsroom who started getting them several years ago. The green sheet on the Camp Fire — the blaze that killed 86 people, by the current count, and destroyed 14,000 residences in Paradise and two nearby communities in Butte County — came out late last week. The bulk of the report recounted how five firefighters suffered burns during the first 24 hours of the blaze. But in setting the scene for how the injuries, sustained in two separate incidents, occurred, the report also sets the scene: the drought, the high winds, the low humidity that helped the fire become so monstrously destructive so rapidly. I like a striking historical reference as much as the next human. But the Cal Fire offers no further context or detail about “the firestorm that consumed Hamburg, Germany, in 1943.” Maybe it was a super-bad wildfire. Of course, the year “1943” suggests a connection to a major historical event that’s known even to most ahistorically minded Americans: World War II. Even if you’re not a historian, you may be familiar with the heavy bombing that took place throughout the war and several noted incendiary bombing attacks, mostly by U.S. and British air forces against targets in Germany and Japan. Thanks to Google, a couple of pretty good accounts of what happened in Hamburg pop up when you search the name of the city along with the word “firestorm.” One of them comes from the BBC, which describes the relentless British and American bombing that touched off the inferno, the winds that accompanied it, the appalling casualty count, and the harrowing stories of survivors. In a passage cited in “The Oxford English Dictionary” as an early use of the word “firestorm” to describe the effects of aerial bombing, the survey mentions in brief, clinical detail what happened in Hamburg and the tactics behind such attacks. Many German cities presented partial areas of vast devastation. Perhaps the outstanding example was Hamburg, where a series of attacks in July and August of 1943 destroyed 55 to 60 percent of the city, did damage in an area of 30 square miles, completely burned out 12.5 square miles, wiped out 300,000 dwelling units, and made 750,000 people homeless. German estimates range from 60,000 to 100,000 persons killed, many of them in shelters where they were reached by carbon-monoxide poisoning. The attacks used both high explosive and incendiary bombs as it was thought by the Air Forces and later confirmed that the former created road blocks, broke water mains, disrupted communications, opened buildings, broke windows, and displaced roofing. Most important, they kept the fire fighters in shelters until the incendiaries became effective. But, of the total destruction, 75 to 80 percent was due to fires, particularly to those in which the so-called fire-storm phenomenon was observed. Fire-storms occurred in Hamburg, Kassel, Darmstadt, and Dresden. Differing from an ordinary peacetime conflagration which begins at a center and then spreads, these storms occurred when incendiaries started many fires within a relatively short time over an extensively built-up area. It was estimated that, in Hamburg, within 20 minutes, two out of three buildings were afire within a 4.5-square-mile area as the result of incendiary bomb strikes. The intensity of the bomb fall was so great that fire-fighting efforts were fruitless. As the many fires broke through the roofs of buildings, there rose a column of heated air more than 2 1/2 miles high and 1 1/2 miles in diameter, as measured by aircraft flying over Hamburg. This column was turbulent and was fed at its base by inrushing cooler ground-surface air. One and one-half miles from the fire this draft increased the wind velocity from 11 to 33 miles per hour. At the edge of the area the velocities must have been appreciably greater, as trees 3 feet in diameter were uprooted. In a short time the temperature reached the ignition point for all combustibles and the entire area was ablaze. In such fires complete burn-out occurred; that is, no trace of combustible materials remained and only after 2 days were the areas cool enough to approach. The evidence is that the bombing served not only to destroy much of Germany’s second-largest city, but also, as intended, to shock and demoralize the population. In one sense — the scale and meaning of the events — the parallel between Paradise and Hamburg is all wrong. But in others — the physical characteristics of the fires, the way they consumed whole communities and left survivors with little or nothing of their prior lives — maybe the comparison is fitting. 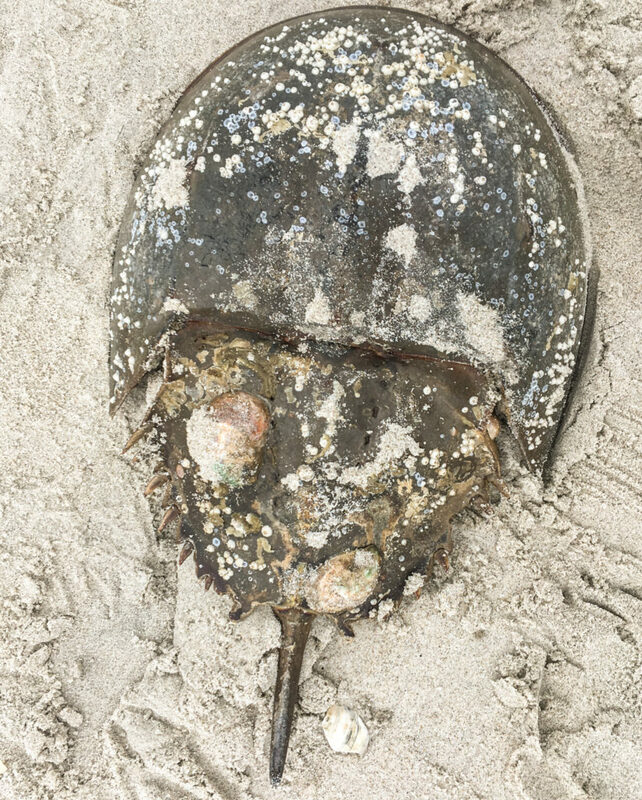 Horseshoe crab on Rockaway Beach, Queens, New York. Post-Thanksgiving, we’re visiting my brother John and family in Brooklyn. One of John’s favorite spots in the metropolis, or anywhere, is Rockaway Beach, part of the barrier islands that face south across Raritan Bay toward northern New Jersey and the open Atlantic. Even though you’re technically within the city limits, it seems like a long trip, either driving or on the train. Today, John borrowed a car, and we drove out there with a couple of cameras each to walk and take pictures. We happened across the specimen above soon after getting to the san at Beach 116th Street (and yes, it’s “Beach 116th Street,” and I don’t yet know how the numbered streets in this part of the city came by that designation, though maybe it helps avoid confusion with other numbered streets in the metropolis). 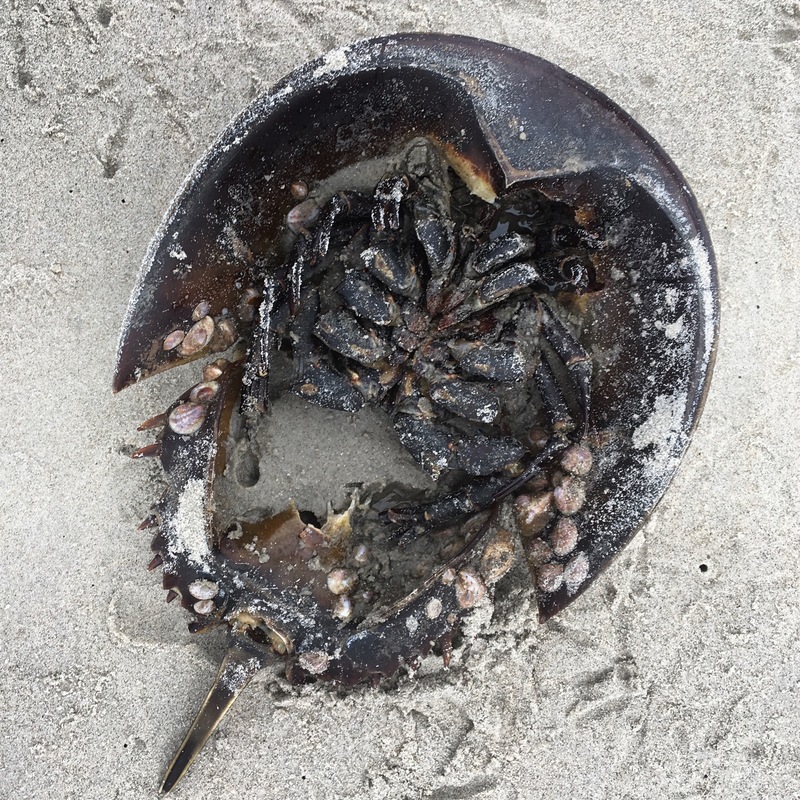 So, that’s a horseshoe crab. And until a week ago, when I first heard a repeat episode of “Radiolab” that explained horseshoe crabs’ unique (and crucial) place in the world of pharmaceuticals and biotechnology, I wasn’t aware that they were significant beyond the fact of their existence. But it turns out it can be quite credibly argued that every modern medical procedure you’re ever undergone — or at least those that involve some interaction with or contact with your blood — has depended on a sort of involuntary gift from an organism that evolved nearly half a billion years ago. The thing about the blood that everyone notices first: It’s blue, baby blue. The marvelous thing about horseshoe crab blood, though, isn’t the color. It’s a chemical found only in the amoebocytes of its blood cells that can detect mere traces of bacterial presence and trap them in inescapable clots. On Rockaway Beach, Queens, New York. I once almost visited Atlanta — made it to a vague part of what I recall to be the northwestern outskirts — in 1972. It is an enduring memory, fogged as it is with the exhaustion and anxiety that attended the episode and a certain amount of lingering regret. You’d like to hear more — exhaustion? anxiety? regret? — but I’m not going to go into all that right this minute. I’m in Atlanta for real now for the wedding of a former KQED colleague. And while I have not done a lot of exploring as of yet, I can say that I like the woodsy corner of the city I’ve landed in. The neighborhood is called Kirkwood, adjacent (or at least close) to Decatur in Atlanta’s northeastern quadrant. One notable finding when I walked to breakfast late this morning — a discovery that may be entirely commonplace to the locals — is the profusion of mockingbirds (Mimus polyglottos) hereabouts. So, here is a Kirkwood variation on the mockingbird’s never-ending solo. Part of the ruins of St. Francis Dam, northeast of Los Angeles. We managed to spend a whole day on the road today without getting out of Los Angeles County. 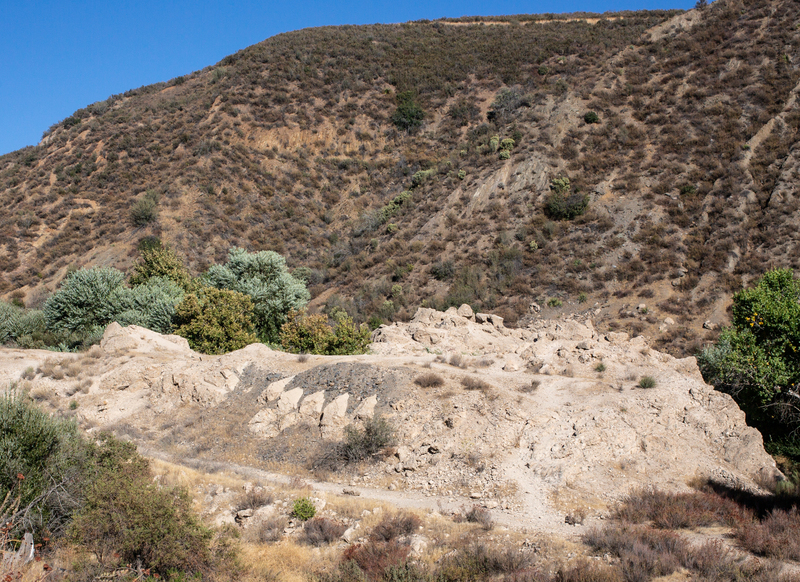 The main detour of the day was a search for the site of St. Francis Dam, which collapsed in 1928, killed at least 450 people, ended the career of William Mulholland, and wrought major changes in dam design and engineering. We finally made it to the dam site in the waning half of the afternoon and spent a half an hour or so hiking part of the area (it’s worth more time; I hope to come back … soon-ish). There is a lot of great background material on what happened at the dam. The best may be from J. David Rogers, a Berkeley-trained professor of geological engineering at the Missouri University of Science and Technology in Rolla who has spent decades investigating why the dam failed and documenting the disaster’s effect on the practice of engineering. The magnitude of the tragedy is a little hard to grasp standing at the dam site. There are some monumental heaps of rubble. If you look around, you can see evidence that the piles of broken concrete were part of something bigger. But nature is reclaiming the site. A cool wind blew up through the cottonwoods and maples that have taken over the streambed where the calamity began. San Francisquito Creek sounded fresh and alive. One note: It’s a little odd that there’s no official recognition of the site beyond a state historical marker about a mile and a half away — at the powerhouse that was destroyed in the 1928 torrent. This is a place — apparently national forest land — that deserves to be remembered and interpreted. Road Blog: Days and Nights in L.A. 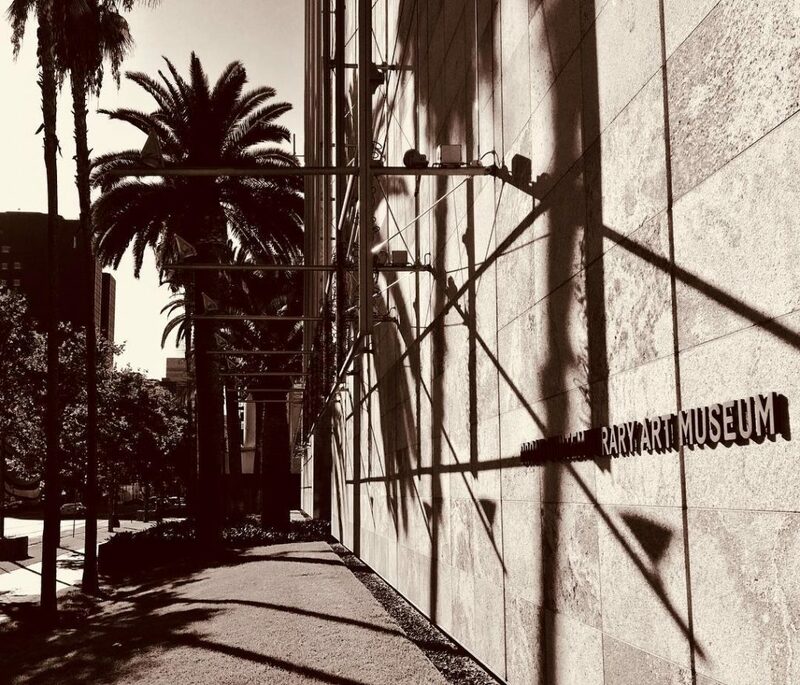 The Eli Broad wing of the Los Angeles County Museum of Art on Wilshire Avenue. 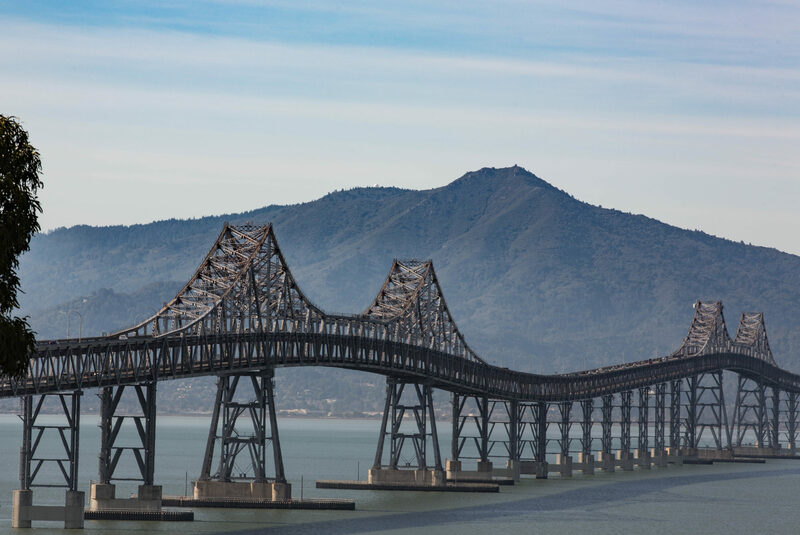 I have spent nearly all of the last 42 years in California, and all of that in the San Francisco Bay Area. I’ve visited Los Angeles about a dozen times. I only get to double figures by counting episodes like the time I delivered a drive-away car, a white Chevy Vega station wagon, to its perhaps rueful owner in Venice Beach; and day trips to do interviews for stories I’ve worked on; and visits to Disneyland, which some may dispute involve a visit to “Los Angeles.” It is not an impressive list, especially considering you can’t have any real idea of California without at least a passing acquaintance with this place. So here we are on Day Three of dropping in for a visit and just … staying put for the most part. Example of what I mean by “staying put.” Thom and Megan found an apartment that’s a short walk from the Los Angeles County Museum of Art. Today, we went to check the place out and spent the afternoon there (and spent virtually all of the time visiting one exhibit on the evolution and applications, practical and artistic, of three-dimensional imaging technology. After that, it was back to the apartment, then a hike to the Los Angeles Farmer’s Market — which is actually a warren of dozens of restaurants and shops, including a couple that sell produce, that is reminiscent of the shopping district adjacent to Tokyo’s Asakusa Shrine — to buy some salad stuff for dinner, which was pizza. Anyway: This is Night Three in Los Angeles — and I believe it’s the first time I’ve ever spent three nights here in a row.